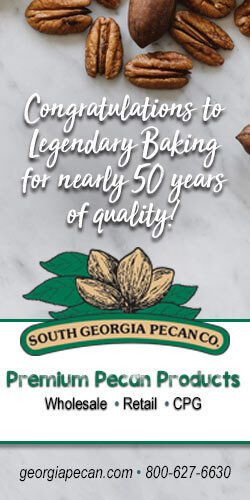 For nearly 50 years, Legendary Baking has lived up to its name by producing delicious, award-winning pies and other desserts. The quality of the company’s pies begins with their crusts. Legendary Baking makes sure that its shortening and flour are the right temperature before mixing them, which ensures a light and flaky crust. “We have had the same processes in place since the beginning, and have never changed how we make our crust in that time,” he adds. Since 2003, Legendary Baking’s pies have won more than 750 blue ribbons at the American Pie Council’s National Pie Championships, more than any other bakery. The company dates its history back to 1969 to a restaurant in Des Moines, Iowa, that served soups, sandwiches, fresh-baked cream pies and double-crust fruit pies. The pies in particular proved to be popular among customers, and the restaurant eventually was purchased and renamed Poppin’ Fresh Pies. More restaurants were opened, necessitating the need for a centralized bakery to ensure the pies were available, Kanaly says. In 1983, the owner and franchisor of Village Inn Restaurants purchased Poppin’ Fresh Pies and changed its name to Bakers Square. The bakery operation serving Village Inn and Bakers Square restaurants was renamed in 2010 to Legendary Baking. All three companies are owned by American Blue Ribbon Holdings LLC. Legendary Baking today provides fresh pies to Village Inn and Bakers Square locations throughout the Midwest. The company also produces frozen pies sold in over 17,000 retail and restaurant locations nationwide. In addition to pies, the company produces a full range of premium baked desserts including brownies, cookies, cakes, cobblers, crusts and fillings. Legendary Baking bakes roughly 27 million pies annually in bakeries in Santa Ana, Calif.; Chaska, Minn.; and Chicago. The Chicago facility includes a frozen storage warehouse, from which its frozen products are shipped. Pies are produced in a variety of sizes including 5-, 6-, 8-, 9-, 10-, 11- and 12-inches. The Santa Ana plant was opened last year. The company also recently increased its efficiency by adding a new pie production line in Chaska. The new plant places the company closer to its customers on the West Coast and increases it overall capacity, while the new production line improves its overall throughput and reduces its need for labor. 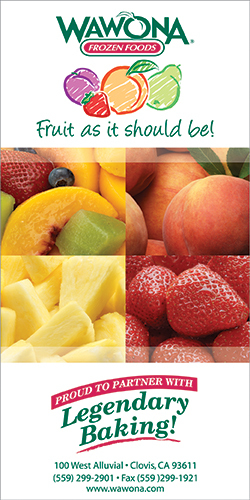 All of the company’s bakeries are Safe Quality Food (SQF) Level 3 certified and follow Hazard Analysis Critical Control Points (HACCP), allergen control and integrated pest management practices. The quality of Legendary Baking’s products is further assured by the company’s use of advanced X-ray technology, metal detectors and check weighers in its inspection processes.